(MP170). W L Wyllie (1851-1931). Watercolour signed and annotated Submarines in the Channel..
Standard size: 17 x 9.5 ins (43 x 24 cms) approx. Provenance: N R Omell Galleries, Marine Exhibition, autumn 1985. 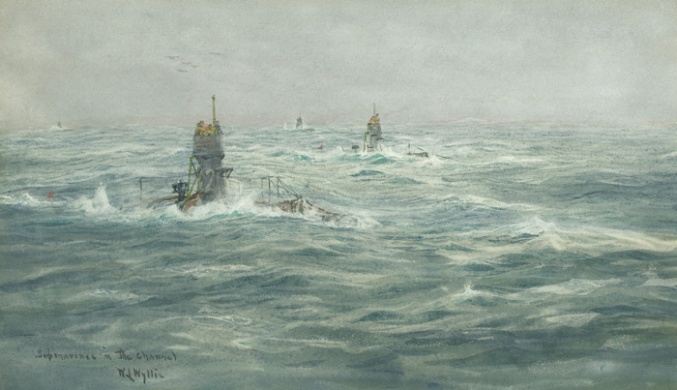 A beautiful, simple, atmospheric WLW watercolour of four B Class submarines of the Royal Navy pottering about in a cold, lumpy English Channel sometime around 1906-1914. Eleven of these boats were built in the period 1904-06, all by Messrs Vickers at Barrow-in-Furness. 135 ft (53m) long and with a complement of 16 officers and men the submarines displaced around 280 tons (surfaced), 313 tons (submerged) and with their single 16 cylinder 600 horsepower petrol engine they were capable of the then impressive submerged speed of around 8 knots and could make some 13 knots on the surface. They had a very handy surfaced range of 1000 miles at 8 knots and carried two 18 inch bow torpedo tubes. The third class of submarine to be introduced into the RN (the five Hollands had completed 1901-03, the thirteen A Class 1903-05), they were the first RN submarines to be fitted with bow hydroplanes. Only ten of the class survived to enter the Great War in 1914, B2 (the very submarine shown here in the foreground) having been rammed and sunk in the early hours of the morning of 4th October 1912 by the Holland-America liner SS AMERIKA four miles off Dover. Only one man was pulled from the water before the submarine sank quickly: she remains unsalvaged to this day. Her assailant, AMERIKA, had been built by Harland &Wolff of Belfast (who some 6 years later were to build RMS TITANIC) and when first completed in 1906 was the world’s largest ship (with a displacement of 22,000 tons). It just so happened that some six months before this collision, in April 1912 when she was in the vicinity of TITANIC who was then on her maiden voyage, AMERIKA transmitted a signal saying she had sighted several large icebergs on the shipping route in which both ships were steaming: records show that TITANIC did receive the signal but unfortunately it never found its way to the officer of the watch on the bridge. AMERIKA went on to have two very busy and interesting wars and survived until 1958 by which time she was nearly 55 years old. It was in B11 that Lieutenant Norman Holbrook won his VC for feeling his way submerged through a minefield in the Dardanelles and sinking SS MESSOUDIEH off Chanakkle to become the RN’s first Victoria Cross winner of the Great War. HMS B10 was the only war loss of the class, being sunk whilst alongside in Venice dockyard undergoing repairs in 1916. All the B’s had passed out of service by 1921.